It’s summertime. Why should big kids get to have all the fun? Babies love the chance to get fresh air; and, there’s no better time to do it than in the summertime, when there’s plenty to see and do outdoors. Before you head outside, though, make sure your baby is properly protected from the elements. Dress him in cool breathable fabrics like cotton, along with a floppy sun hat that covers his head, face, and neck. You should plan to keep your baby out of the direct sun altogether, but if you do find yourself in the sun, keep your baby’s arms and legs covered and apply sunscreen to his hands and face. When choosing sunscreen, your best bet is one of the so-called “chemical-free” sunscreens made with zinc oxide or titanium dioxide. These sunscreens sit on top of the skin rather than getting absorbed. Test the sunscreen on a very small patch of skin before slathering it on to make sure that there’s no reaction. And check with your doctor if your child has special sensitivities. Additionally, try to use good sense about when to go outside. In general, you should avoid heading outside in the peak heat times of the day (11 am to 1 pm). Plus, if the weather is especially hot, you and your baby should both stay hydrated. Babies under six months old should drink more breastmilk or formula to replace lost fluids; beyond six months old they can drink a modest amount of water. Even if they’re too little to enjoy the playground equipment, they will love the chance to feel some green grass in their toes. Bring a blanket and a few small toys and find a nice shady spot to sit in. 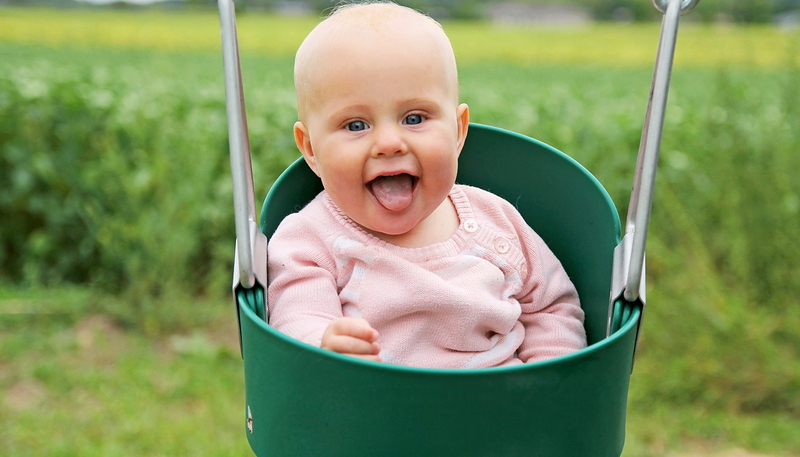 Once your little one has good head and upper body control (at least five months) she will enjoy the baby swings and even the slide, if you hold on to her while she rides down. Most doctors recommend that infants younger than three months old not go in a pool, and some would more conservatively say six months is the earliest age for swimming. Nevertheless, if your family goes to the pool, your infant can sit in the shade and enjoy the sound of the water splashing. By six months, most babies will love to have you carry them around in the water with you. Plus, they love to play with plastic cups and pitchers, so you don’t need to buy fancy toys. Once they’re comfortable in the water, they will enjoy kicking, splashing, pouring, and even dunking. Try to avoid using inflatable flotation devices – they create a false sense of security and are not 100 percent reliable. Additionally, make sure that the water is warm enough so that your baby does not get chilled. Most babies love the beach even without getting in the water. The warm breeze, the crashing waves, the soft sand – what’s not to like? When you take your baby to the beach, make sure that you follow all of the usual precautions for the sun, and consider giving her the extra protection of a sun tent that is SPF-rated (extra bonus: it’s a great place for a nap!). Bring along some simple beach toys (shovels, cups, balls) and let your little one have a fun sensory experience in the sand or near the water’s edge. Tip: A light dusting of baby powder is great for getting off wet, sticky sand – especially when it’s time for a diaper change. 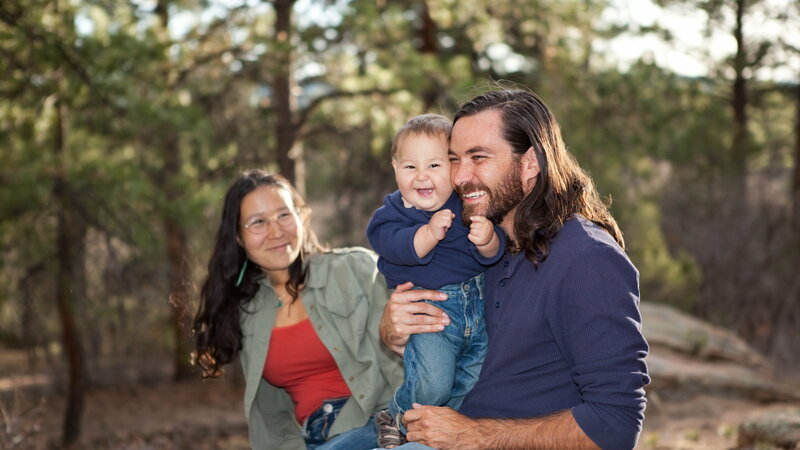 You can probably take your baby hiking or camping as soon as you’re willing and able to do it. The main thing you’ll need is a comfortable baby carrier or backpack, and plenty of protection from the elements. Once you arrive at your destination, your baby will love the new sights and sounds. Prop her up in a baby chair so she can see all of the activity. You can use bug repellant containing DEET on babies older than two months, but you should avoid putting it on their hands because they tend to put their hands in their mouths. If you don’t want to use DEET, you can also use products containing citronella. Camping overnight is up to you and your baby’s comfort; many parents who do this bring along a portable playpen for the baby to sleep in. Who says you have to go anywhere? Most babies are just happy to be outside. Your little one will love watching and listening to whatever is going on (birds and butterflies flying around, wind chimes ringing) and he’ll have an even better time if you roll him a ball or turn on the sprinkler. Kiddie pools can be fun too, but never sit more than an arm’s length away from your baby and follow all water safety rules. Most of all, babies just love to be with you. 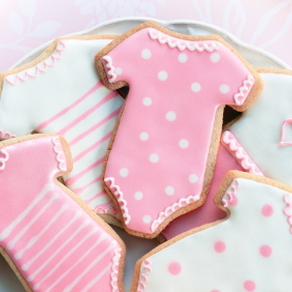 So whether you’re at the beach or in the backyard, your baby will love any change of scenery you can give him. And by next summer, he’s sure to be running everywhere under the sun.